Despite being a very good phone, the LG G6 has been steadily dropping in price ever since its release. With the release of the V30, the phone has hit one of the lowest prices we've ever seen in US unlocked guise: $469.99. 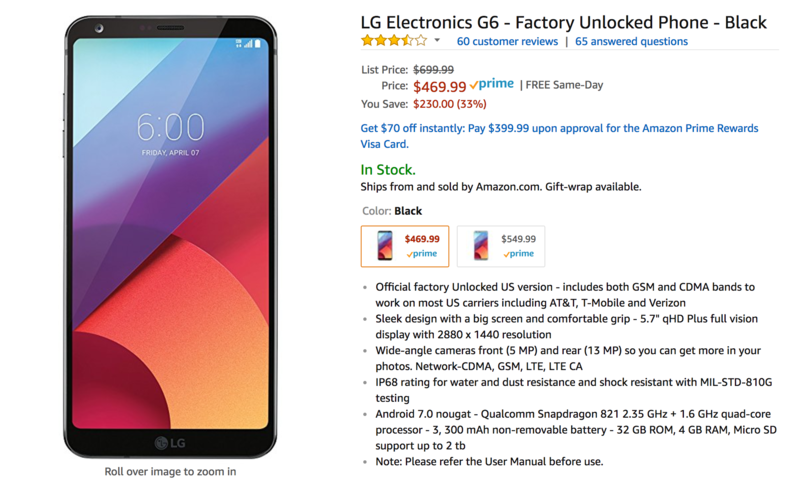 That's a full $30 less than the next best US unlocked G6 deal we've posted. The G6 sports a 5.7" 1440p LCD display in an 18:9 aspect ratio, a Snapdragon 821, 4GB of RAM, 32GB of storage with microSD expansion, a dual camera setup on the back, a 5MP shooter up front, and a 3300mAh battery. There's also IP68 water resistance and wireless charging on board (since this is a US model). It's a very well-rounded device. Amazon has only discounted the black one to $469.99 with the platinum model still showing a $549.99 price, but B&H has slashed the prices on both colors. Shipping is free from both retailers, but Amazon has free same-day shipping for Prime subscribers and B&H has in-store pickup at its NYC location. However, Amazon charges tax for everyone, while B&H only adds tax to those located in New York and New Jersey. We're not sure how long these deals will last for, so don't wait too long if you're interested.